Any camp questions may be directed to Coach Jim Lodes at 585-475-5295 or jelatl@rit.edu. 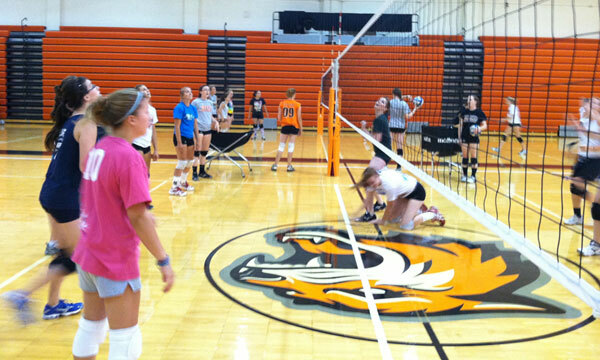 This camp is designed for all levels of volleyball athletes ages 10-18. Campers are divided onto courts by skill level, age and experience, which will provide the appropriate learning environment. You will get the instruction and training that is appropriate for you. Instruction and training includes the skills and techniques of serving, passing, setting, attacking, blocking and individual defense. A variety of drills, games and competition will be used to put these techniques into practice with emphasis placed on court movement, ball control, and competition. This is a four-day (nine sessions) camp ideal for both learning and improvement. The fee includes registration, housing (three nights), all meals and a camp T-shirt for residential. For commuters, the fee includes registration, some meals (lunch and dinner on 7/9 & 7/10, and lunch on 7/11) and a camp T-shirt. This camp is designed for the player interested in specialized skill training. Each camp is geared for the beginning, intermediate and advanced level player looking to focus on a specialized position. Players from ages 10 to 18 interested in three days of drills and training will benefit from this experience. This camp is a three day (7 sessions) training camp. For residential campers, the fee includes registration, housing (two nights), all meals and a camp T-shirt. For commuters, the fee includes registration, some meals (dinner on July 12, lunch and dinner on July 13, lunch on July 14) and a camp T-shirt. SETTER CAMP which concentrates on setting skill techniques with training repetitions in footwork, attack skills, and various set types. HITTER CAMP which will focus on a variety of attack skills from the outside hitter, middle hitter and right side attackers. Quick attacks, as well as play-sets, for the hitter will also be emphasized. Footwork, arm swing, and blocking skills will also be of primary focus. Please identify your position on application (OH, MH, RSH). LIBERO CAMP which concentrates on all passing and defensive skill techniques with training repetitions in footwork, ball control, as well as, extend and recover. This camp is designed for all levels of volleyball athletes ages 10-18. Campers are divided onto courts by skill level, age and experience, which provide the appropriate learning environment. You will get the instruction and training that is appropriate for you. Instruction and training includes the skills and techniques of serving, passing, setting, attacking, blocking and individual defense. Emphasis is placed on court movement, ball control, and game competition. A variety of drills, games and competition will be used to put these techniques into practice. This is a four day (eight sessions) camp ideal for both learning and improvement. The fee includes registration, daily lunches and a camp T-shirt.